To date, this is the best you will ever experience Die Hard. Back in the late 1980s, a little film called Die Hard, starring an unknown action star at the time whose only previous body of work was in comedy, came crashing onto the screen and the action genre has never been the same. Now, for its 30th Anniversary, 20th Century Fox Home Entertainment is releasing the film like it has never been released before, in 4K UHD. Die Hard, adapted for the screen by Steven E. de Souza (Commando) and Jeb Stuart from the book Nothing Lasts Forever, by Roderick Thorp, tells the story of New York City cop John McClain (Bruce Willis; The Fifth Element) who is vacationing in California for the holidays with his family and estranged wife (Bonnie Bedelia; Designated Survivor). However, what is supposed to be a quick stop at her office holiday party doesn't end up as planned. Terrorists have taken over the building and have something else in mind for McClain and the people trapped in the Nakatomi Plaza on Christmas Eve. To call Die Hard a masterpiece in cinema is giving it too little credit. Director John McTiernan (Predator) creates hands down the best action movie to date. While today the troupes featured in Die Hard are seen as standard fare, they truly were revolutionary in 1988 — a clever, smart villain, (Alan Rickman; Harry Potter Series), a strong female lead (Bonnie Bedelia), and a wise-cracking down and dirty anti-hero (Bruce Willis). This is all wrapped up in a story where you can actually track the hero's progress. However, while there certainly is a story unfolding on screen, the plot takes a backseat to the action and the over-the-top, classic Bruce Willis performance. That, along with stunts that made audience's eyes pop out of their head, propelled this film to stardom and spawned many sequels. The Die Hard 4K UHD presents a brand new 2.39:1 scan from the original negative. There is some grain evident, which is normal, and the new HDR color scheme really punches up the highlights, shadows, and colors of the film while maintaining its original look and feel conceived by director of photography Jan de Bont (Speed) and Director and John McTiernan. The Blu-ray included in this release, unfortunately, is not shown the same love and is just the same scan as the previous Blu-ray release. The DTS-HD Master Audio mix is also ported over from the previous Blu-ray release, and while it would be nice to have a Dolby X or Dolby Atmos soundtrack, this DTS master is still an improvement over its theatrical Dolby Stereo Surround sound. The special features for the 4k UHD release of Die Hard are also carried over from the previous release. This includes a Digital HD copy of the film, audio commentary, newscast footage, a still gallery, trailers, and D-Box motion code for those with this system in their home theater. Die Hard revolutionized the action film genre and its influence is still felt today. While this release pours over many of the features found on its old incarnations dating back to Laserdisc, the picture quality is hands down the best it has ever looked. 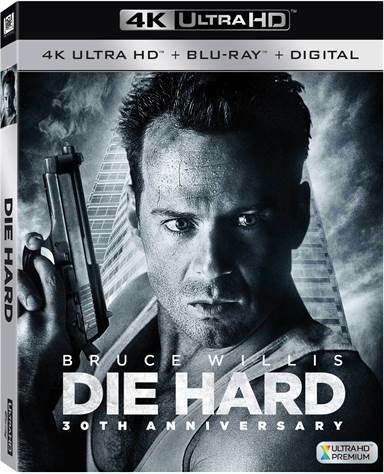 If you are a fan of the original Die Hard, you owe it to yourself to pick up this release for the video quality alone. Maybe in the future, one can double dip if they bump up the audio specs, but until then, this is the best you will ever experience Die Hard. Download Die Hard from the iTunes Store in Digial HD. For more information about Die Hard visit the FlickDirect Movie Database.